Posted on 23, July 2018 by EuropaWire PR Editors | This entry was posted in Austria, Business, Electronics & Machinery, Entertainment, Food & Beverage, Internet & Online, Italy, Marketing, News, Retail, Small Business, Technology, Travel and tagged ABOX 3 2.0, advanced point of sale systems, Atos, ATOS 15 Elegant, ATOS Android software, Austria, automatic cash desks, Cash Desk K2 Slim, cash registers, catering sector, cloud-based solutions, DATA4, electronic payments, eye-catching POS system, FAFGA, FAFGA 2018, Fiorenza Mella, food and beverage industry, food beverage, hardware, hospitality industry, hotel sector, innovative payment systems, Innsbruck, Italian design, kitchen monitors, merchants, MFC magnetic card, multi-payment kiosk, NFC reader, Paolo Biasone, Point of Sale, POS, POS solutions, POS systems, POS technology, RCH Europe, RCH Group, retail, scales, self-service ticketing kiosk, Smart POS systems, smart selling solutions, software, trade fair, VESA Mounting Interface Standard, Xpresso Communications. Bookmark the permalink. TREVISO, Italy, 23-Jul-2018 — /EuropaWire/ — Technology is revolutionising the way in which we live and do business. In the hospitality industry where speed and quality of service is critical, organisations must embrace the latest POS technology if they are to maintain a competitive edge in today’s fast-paced digital world. FAFGA is the leading trade fair for the hotel and catering sector, taking place in Innsbruck, Austria from September 10th to 13th 2018. Following a very successful show in 2017, RCH Group is returning to FAFGA for a second year to fortify its presence in the region and to demonstrate how its hardware and software smart selling solutions are revolutionising the Point of Sale as we know it. This time though, RCH Group will be represented by RCH Europe, the European operation launched in January 2018 and headquartered in Innsbruck. In Hall B0 on Stand 62A, visitors will see and experience a number of powerful cloud-based solutions, catering specifically to one or more points in the sales cycle. Each RCH product is based on decades of research and development and capable of interoperating with third-party systems. The opening of RCH Europe in Austria has quickly enabled RCH Group to provide more effective and faster local support to its customers and reseller partners, further enhancing the trustworthy business relationships and high level of customer service that the company is renowned for. The increasing European customer base coupled with the necessity to have centralised operations to handle all regional deployments and after-sales technical support made Austria the ideal location. In response to end-users increased need for space reduction, RCH Europe will be launching at FAFGA an upgrade to the ATOS product range, which now comes complete with a wall mount and arm in accordance with the VESA Mounting Interface Standard. This thin mounting bracket provides an excellent space-saving solution for all catering facilities, allowing traders to mount the ATOS screen directly on to a wall, thus creating a clutter-free workspace. As like all RCH products, this new VESA mount is a functional, easy to use and aesthetic tool that is beautifully designed with the elegant Italian touch. ATOS 15 Elegant combines pure elegance with high-end technology and comes with a 16:9 fully adjustable monitor that is supported by the stability of a solid chrome-effect base. 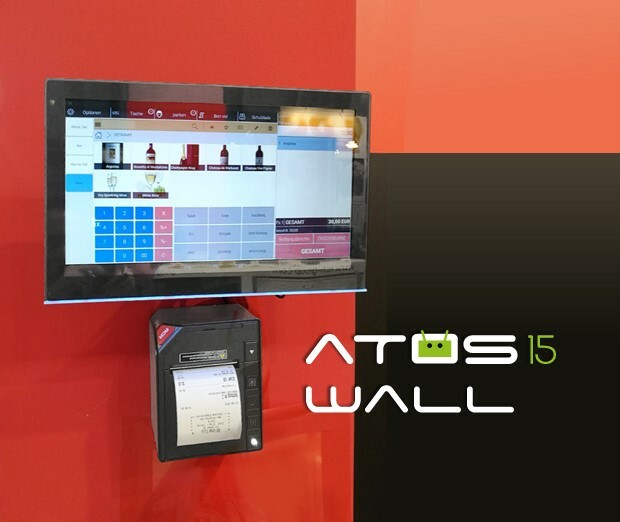 Efficient hardware coupled with intelligent software makes ATOS 15 Elegant the ideal tool for any Point of Sale. The unit comes with an optional rear customer display that completes its maximum expression of functional elegance. This customer display is available in two different sizes, allowing the merchant to either present the customer with a list of purchased items or alternatively to display its own graphics visualising the consumptions on sale. This back graphic display can be cleverly used as an advertising tool to broadcast the latest news and in-store promotions, giving added value to any POS. Multiple connections including Ethernet, USB and Micro SD allowing the ATOS 15 Elegant to pair with printers, tablets and scanners are all standard. An NFC reader, an MFC magnetic card and an I-Button are additional options with this innovative and eye-catching POS system. Retaining all the features of a multi-payment kiosk for the issuance of receipts and/or tickets, Cash Desk K2 Slim is an automatic device specifically destined for electronic payments. Eliminating the task of handling cash transactions results in a product that’s thinner and smoother in the movements. The device boasts a fast and simple user interface, indicating each operation to be carried out step by step with the aid of visual indicators (LEDs). A multi-lingual and interactive menu allows customers to pay for their goods or services in three easy steps. RCH’s products, characterised by a perfect combination of elegance with the simplicity of functionality, are conceived to be at the centre of the point of sale. Smart on the inside, each product has a distinguished and modern design made in Italy. 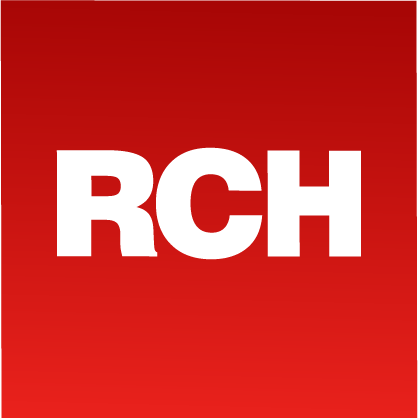 Headquartered in Innsbruck, RCH Europe is a member of RCH Group. The RCH Group of companies offers advanced point of sale systems for the retail, food and beverage, entertainment, hospitality, franchising markets and the public sector. The Group’s innovative products include cash registers, self-service ticketing kiosk, automatic cash desks and cloud-based back office services. Founded in 1969, RCH Group has grown into a global organization, comprising of several companies with a presence in 40 countries worldwide. It is renowned for its successful combination of advanced product engineering with distinctive design. Headquartered in Northern Italy, RCH Group has operational offices in Austria, Vietnam, China, and Asia, as well as a vast network of partner resellers.